Termed as the engine of growth, the MSME sector has a greater role to play for comprehensive development of the economy. Adding employment, wealth and economic stability to the country, the sector cognizes as a crucial spot for government to bring timely policy changes. Leverage of fund investment for Women-led businesses and start-ups: To entail women entrepreneurship through MSME based finance schemes, further allocation of Rs 1330 crore has been proposed to running finance schemes of government including MUDRA Yojana, Start-up India, and Stand-up India, etc. The aid of Artificial intelligence for impending start-ups: To ensure effective delivery of compliances, it was proposed to introduce the concept of Artificial intelligence to support centres of government serving MSMEs and start-ups. Subvention of interest on the loan, if GST compliant: After placing the most desirable finance scheme for MSMEs – Loan up to Rs 1 crore in 59 minutes, the government further proposed a subvention on interest on fresh & incremental loans availed by MSMEs for up to 2 %. Access building of MSMEs to E-marketplaces like GeM: Uplifting trade barriers, MSMEs with the accepted provision by the GeM council, will be allowed to freely sell their products to the government through GeM. GeM is an online platform placed by the government to procure supplies for government departments from the open market. Increase in material sourcing requirement from MSMEs: To strengthen the MSME base in the economy, the sourcing requirements of material by the government from MSMEs will be raised to 25 % substantially hiked from 18 %, of which at least 3% would be sourced through women-led ventures. Limit for presumptive taxation raised for MSMEs : Government has now presented a further relieving update to the tax policy of the MSME sector, widening up the plethora of turnover threshold, it was proposed for all entities recognized as MSMEs to place their tax returns under presumptive taxation to claim its benefits even when their business turnover exceeds 1 crore. This limit has now been affixed to Rs 2 crore. Abolished duties on 36 capital goods: For all manufacturers and exporters registered or not as MSMEs, the government has simplified provisions placed for levying duties on capital goods. Customs duty on about 36 capital goods and the issue of a single point of approval for goods on customs has been recently proposed by the government. GST Exemption limit for MSMEs to 40 lakh: Keeping up with GST, limited remunerative options for MSMEs. To scale small businesses with finite tax barriers, the government recently hiked the GST registration exemption limit for MSMEs from Rs 20 lakh to Rs 40 lakh. Widening of the tax base and single GST return rule for MSMEs: To simplify the GST provisioning on MSMEs registered as composition dealers, the government has now further placed an extension to the basic annual turnover limit to Rs 5 crore for availing the composition scheme of GST. 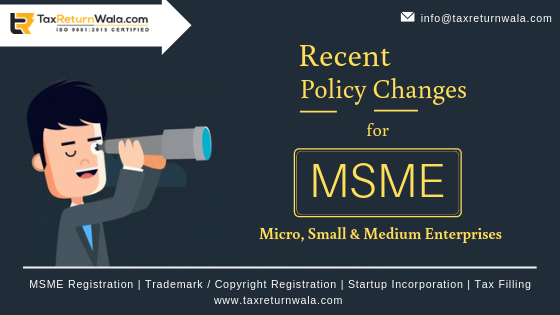 MSME entities opting composition rule will be allowed to file their return once in a quarter. Also, the service sector with an annual turnover below 50 lakh will also be able to claim tax benefits under the composition scheme and place returns on 6% than 18% before. It is well identified that MSME constitutes the backbone of the Indian economy. Placing the above policy decisions for MSMEs, the Interim Finance Minister Piyush Goal said ‘the sector brings employment for crores of people in the country and these are only a few changes we have made with recommendations of the government, more are still yet to come.